It’s been a busy Summer over here with lots of prep work and sewing for the Good Hair Day look book. It turned out amazing! 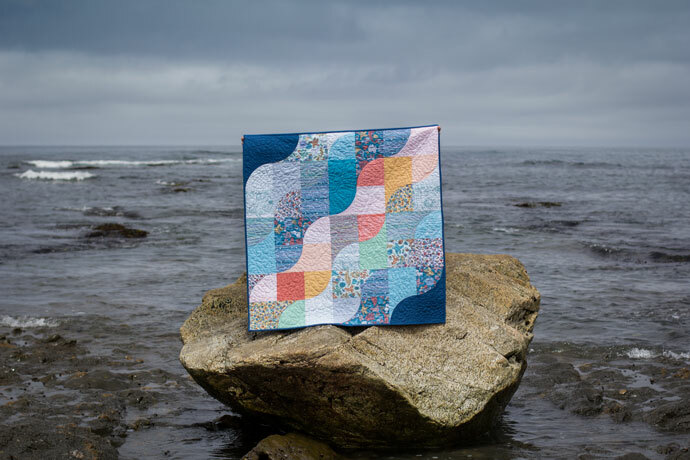 I got to work with the lovely Danielle Collins (photography) and many, many talented makers and quilt designers. I’ll go into more detail later on all the projects, but for now go see the Good Hair Day look book! You can see the whole Good Hair Day collection here too. 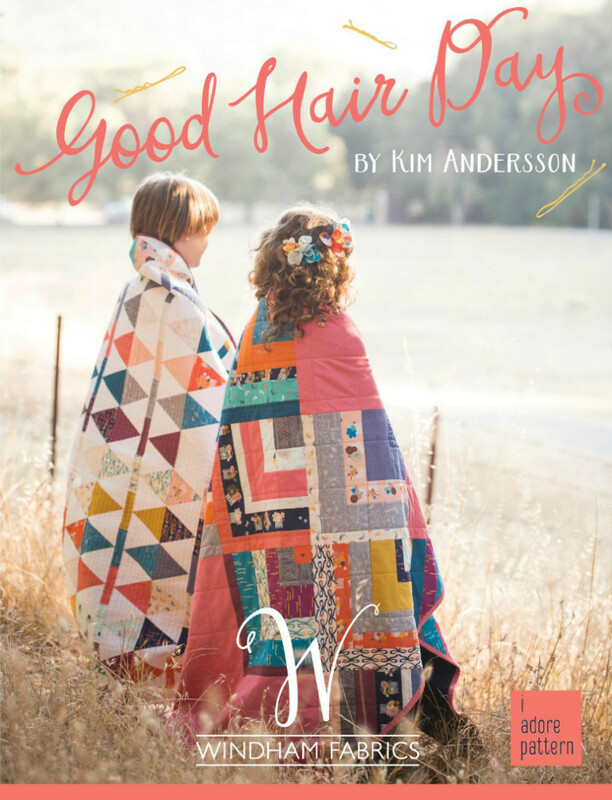 Good Hair Day arrives in stores this December! What will you make? I’ve been tagged by Stacey @ Stacey In Stitches to join the Around the World Blog Hop and today is my day! I only recently heard about this amazing idea, I know, I’ve been a bit pre-occupied. The idea behind the Around the World hop is that you answer some questions about your creative work and process and then you tag some other bloggers to continue the Hop around the world on it’s travels. 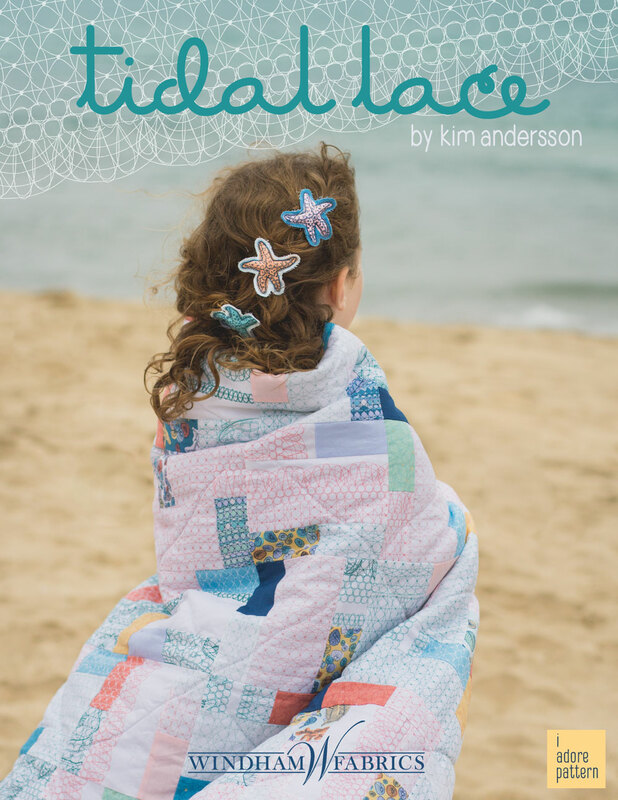 I’ve recently wrapped up the Look Book for my debut collection Tidal Lace with Windham Fabrics. You can see it here and the projects inside it in other past posts (scroll down). It has been an amazing experience seeing my designs printed on fabric and I feel that the process of taking the fabric collection to projects and then to look book gave me the opportunity to stretch myself creatively. Many wonderful creative friends have helped me along every step of the way to making this book. 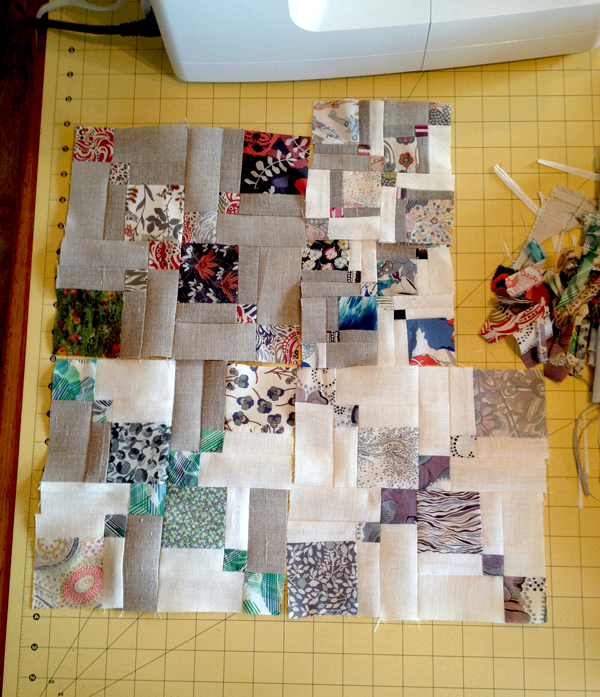 I’m also working on adding and expanding to a quilt that I started at a Jacquie Gering Stitch n Flip improv workshop. I really love the way that it is forming with those pops of color on a monochromatic background of blue tones. 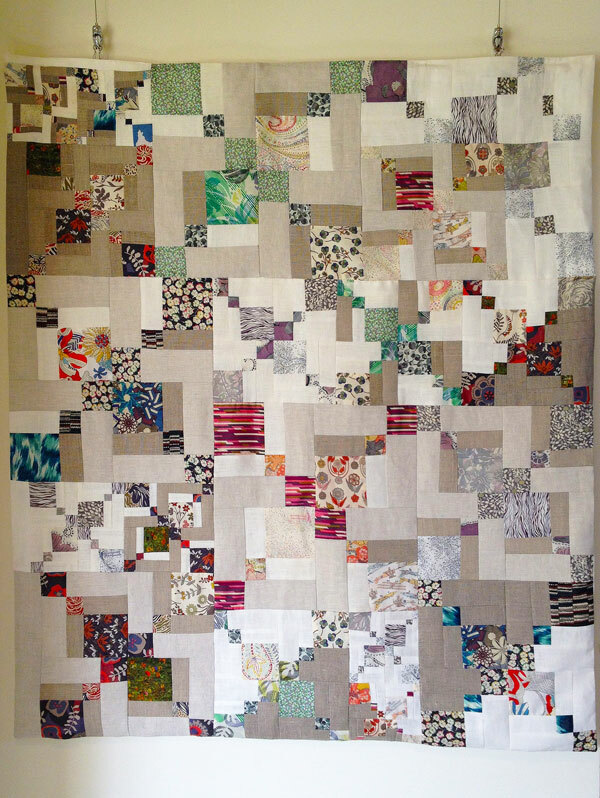 This quilt is in the midst of being quilted so I’ll have more photos soon. I’m going to tackle this question in two parts as my thoughts are different with regard to my sewing/quilting to that of my fabric designs. The one element however, that unites all my work is a wonderful color palette. I’m always looking at color combinations, whether it’s what I’m wearing, a painted wall with a bit of graffiti or a fabulous flower. I’ve built up a library of color combinations that resonate with me, and I think continuing to play and experiment with color is important to keeping that spark in your work. 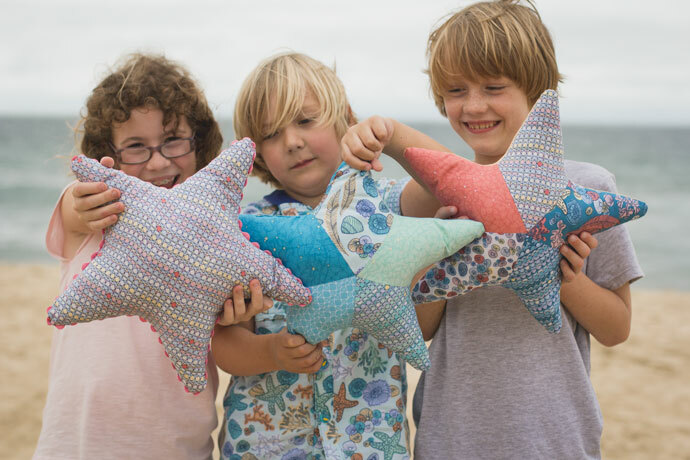 I don’t know that my sewing and quilting work differs that much from what others are doing, I do know that I find it hard to repeat the same project over and over again. I like to make something new and then move on to the next project. 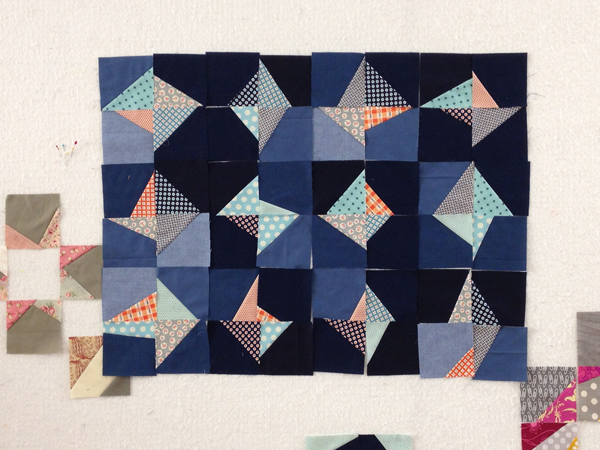 I also find more and more that I really enjoy having some sort of improv element in my quilts. Maybe this is because I don’t like doing the same thing over and over again and when I’m making the same block repeatedly I find it hard to keep that initial momentum. Even just a variation in scale can keep things sparking along. Double Disappearing Nine Patch in process. 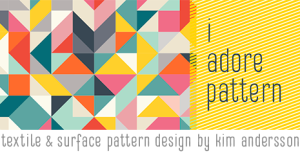 When looking at this question from a fabric design perspective I’d have to say that the response that I mostly get from people about my designs is about my use of color and the stories that I weave into my designs. People have really connected to the backstory of Tidal Lace and the emotion tied into it. Shared memories of exploring tide pools or the beach and time spent with Grandparents while young really resonate with so many of us. I create to express myself and get into the Flow zone (see next question). In the past I found it easier to express myself visually than with words, though now I enjoy telling the stories behind my designs so I have embraced writing more and more. Words seem to take forever to come, but I do find that the more I write the easier it is becoming thankfully. 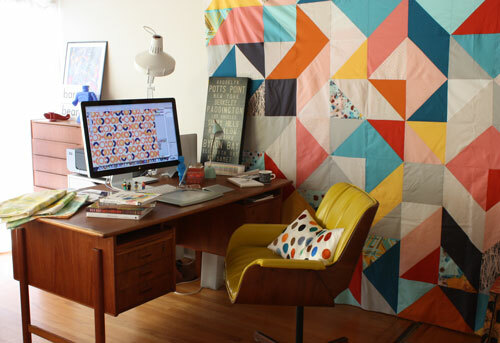 Whether designing fabric or designing a quilt I start at the same place. I begin with an inspiration point and then play around with technique and layout. 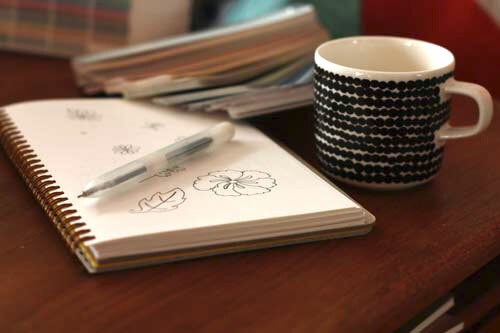 I love the initial research part where I look through many images to find my jumping off point, it might be from a fashion shoot in a magazine, a photo from a family holiday or a squiggle I drew on a post-it. Sometimes I get an idea and have to jot something down straight away before I forget it, sometimes it’s a longer and evolving process. Once I hit on an idea that feels right I continue to iterate on it. I love that feeling of Flow when everything connects and just works. Not that everything works of course, there are starts that don’t seem to lead anywhere. Still, I keep these starts as they may spark something else, or maybe it just isn’t the right time for them. That quilt block may just be waiting for me to have a bit more experience before I can tackle it, maybe I need to ask a friend about it to get that creative spark happening again. 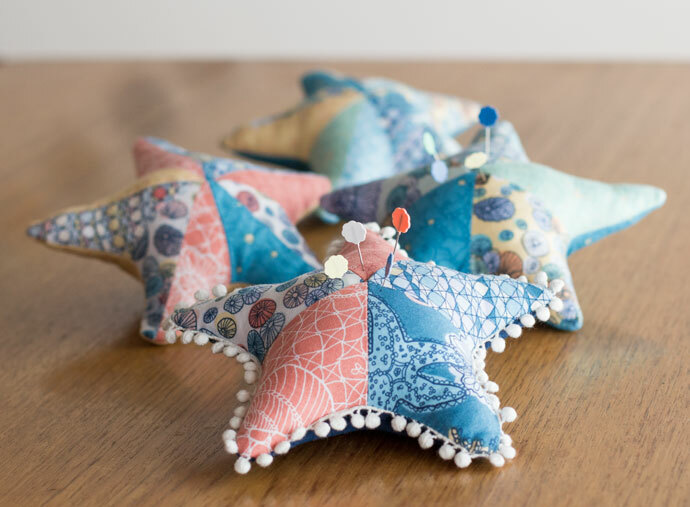 It’s been wonderful to be part of the Around the World Blog Hop, it’s been really useful to put some time aside for a little introspection on my creative process. I’m tagging Carol @ The Plaid Portico and Terri @ The Quilted Fox for the next stops on the hop. Both are wonderful friends and fabulous creative collaborators, when we’re stuck in our creative bubbles it’s great to have friends like this to reach out to. Enjoy traveling on the Around the World Blog Hop!